Once upon a time there was a guy, his family, a bunch of cameras, a Super Camper and lots of passionate ideas. No sponsors. No backup team – Just the open road, a sense of adventure and three months to take full advantage of. I’m Gavin Seim. 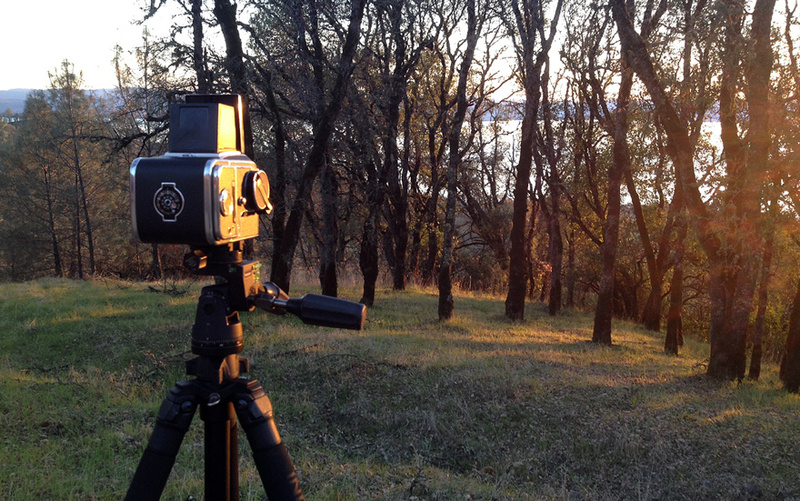 We’re out to explore as we attempt to make images and film that do justice to the beauty America. There’s lots of projects on the menu so we can pay bills and keep gas in the tank. We live mostly by the seat of our pants and enjoy the ride. 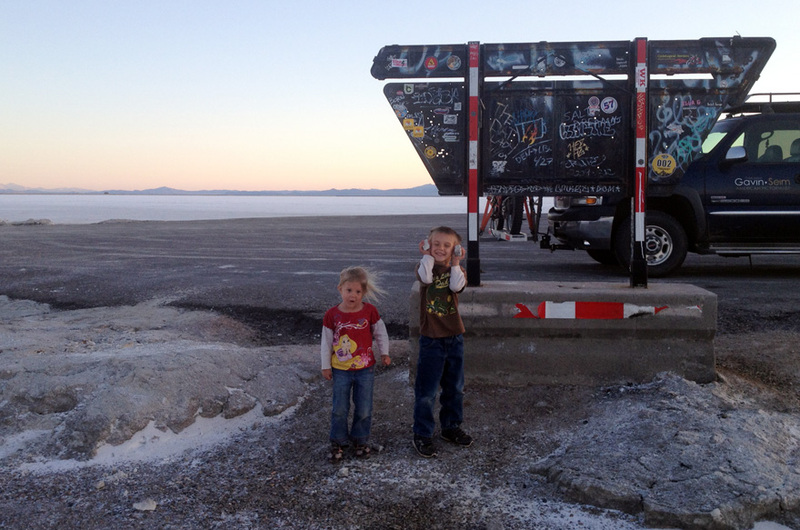 On Feb 2nd 2013 we set out for the road trip of 2013 – It’s a tad intimidating but quite amazing. 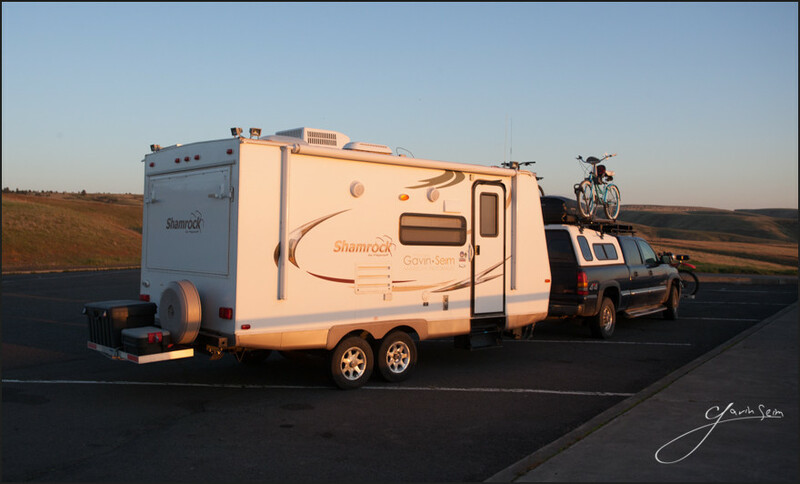 We don’t hang out in RV parks or campgrounds. 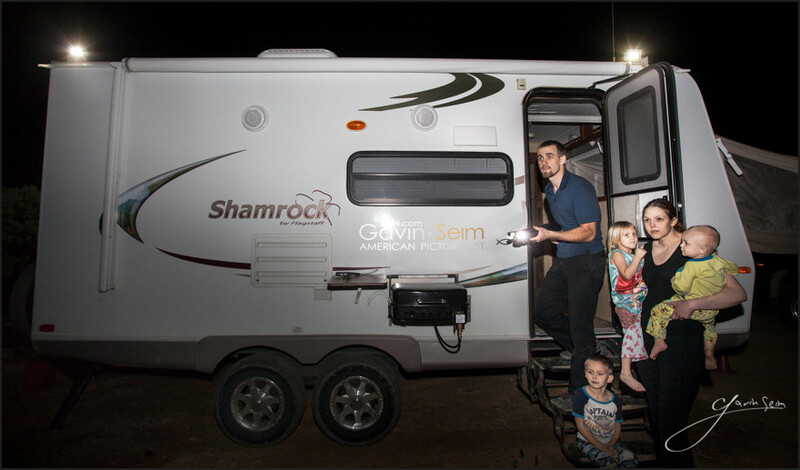 Months on the road in the Super Camper with my wife Sondra and our kids, Cyrus (5) Ariana (3) and Asher (1). There’s new products to test, new images to make, new stories to tell. Last year the big project was the EXposed Light Workshop. This year we’re working on a brand new film called Photographics. 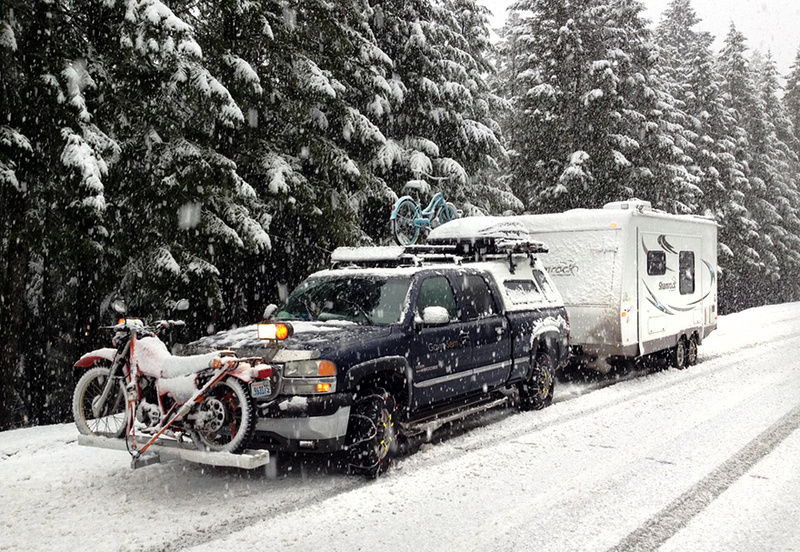 By the way, you can learn more about our rig and tips on how we camp in this article. With Facebook pages becoming less effective and the fact that I can’t send out the Light Letter every day, I wanted to share our journey with you in more detail than ever before. So rather than clutter up the journal with endless micro posts, I’ve decided to try something new – A Road Trip Journal. This journal details our adventures by reverse date. The stuff you normally don’t see. The snapshots, clips, odd happenings and craziness. The things I’m sometimes reluctant to share, being such a perfectionist. That’s what you’ll find here. I hope you join in this adventure. Bookmark this page and come back because we’ll keep updating as long as we can still pound the keys. You can also join my Light Letter below for more updates and stories. Lets roll. Cy likes the shooting gallery at Cabela’s. 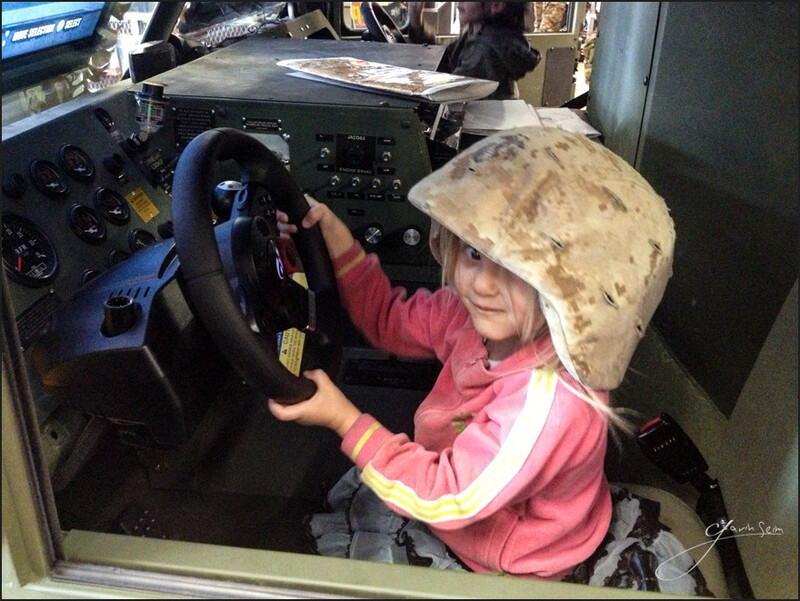 Teach them early. It’s bittersweet as I drive down the hill towards familiar grassy slopes and familiar cities on the map. We watch a Spring sunset and flowers spattering green hills. Three full months on the road we’ve been. An adventure of that won’t be forgotten. Yet a part of me feels somehow less for it coming to an end. Like my spirit of adventure is fading because I long for that slow hot shower, a bed where my toes do not hang over the edge and where my wonderful wife’s elbows do not hit me in the side every time she rolls over. The last few days lacked the grand adventure you look for at the end of a long trip. 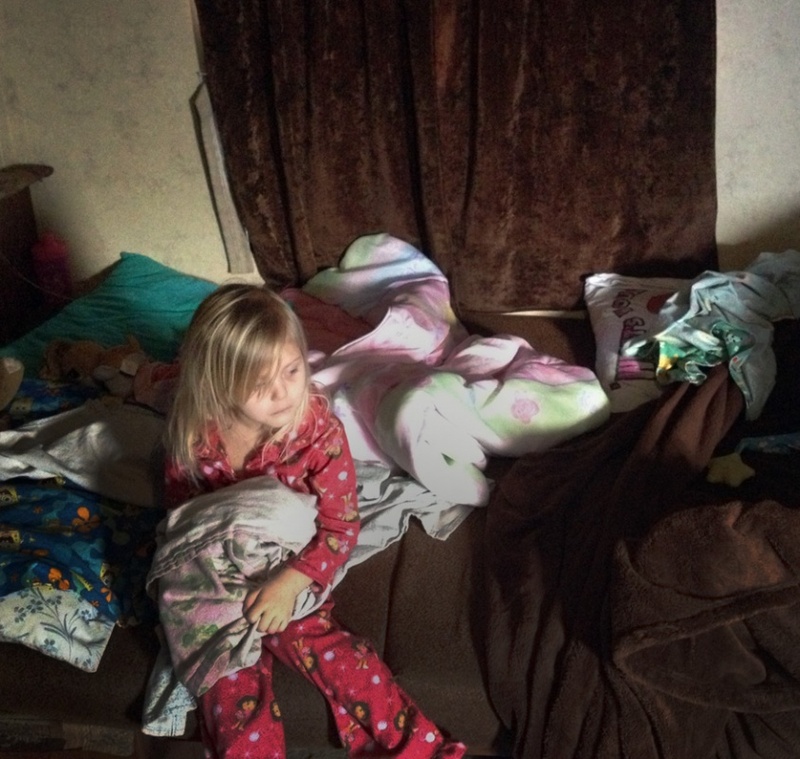 The kids got a stomach bug and did what you do when you have that. Sometimes we had two going at once – The miles were long and we needed to get home soon for Wall Portrait Conference. We drove hard that final day. Perhaps longer than we’ve ever done. Over five hundred miles from Twin Idaho to Ephrata WA. It took us about twelve hours between breaks, gas and pauses to clean up the mess from sick kids in the back seat. “What a lousy way to end such a grand adventure” I thought – But somewhere along the road I stepped into the sunlight and realized it was not. Sometimes we get sick, but it passes. Sometimes things go wrong, we have to make repairs, or we come in late. All of those things happened on this trip. More than once. But they’re part of the memories, part of the adventure. They’re surrounded by moments of laughs and wide eyes glistening at the wounder of creation. The moment I pull in I’m starting a new vacation. We worked hard on this trip. We played hard. It was a gamble too, but our new film PHOTOGRAPHICS is already showing in the black and the trip is all but profitable both emotionally and fiscally. All that time on the road, but so happy to have a place to call home. We walk in after 91 days on the road and switch on the lights. The house is still here, warm, waiting. Nearly as we left it but for a few extra cobwebs. A bed, a shower, a late night movie with my wife after the kids are finally asleep. We really are home. Next it’s time to process the film, repair the gear, make the prints and get organized. On Sunday we’re off for a week again to learn and teach at Wall Portrait Conference. But really we’re home right now. It’s only a couple hours away and among people we know. That home feeling is back. It’s odd. Truly surreal to walk down the isle at the store and for once in so long see people you know. Get a hug from your mom when you walk thru a door, or see neighbors wave as you drive down the street. I honestly feel strange not being the stranger here. But that passes and fades into tales of the adventure and silent longing for more. As the sun shines on our first day home, a breeze blowing, spring flowers popping out, I realize that the world is still alive and that both home and away are something grand. Appreciating your adventure is how you look at it. 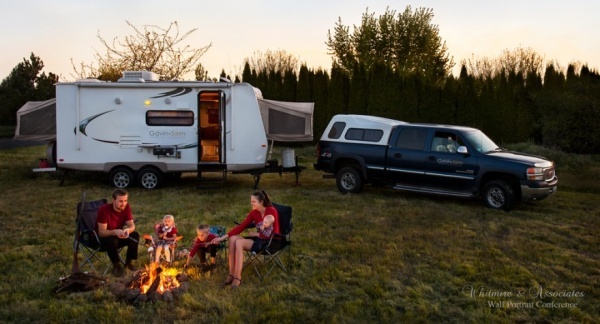 There’s nothing like a place to call home, but there’s also nothing like the open road, your wife riding shotgun and kids kicking the back of your seat as the road rolls by. This is living, all of it. 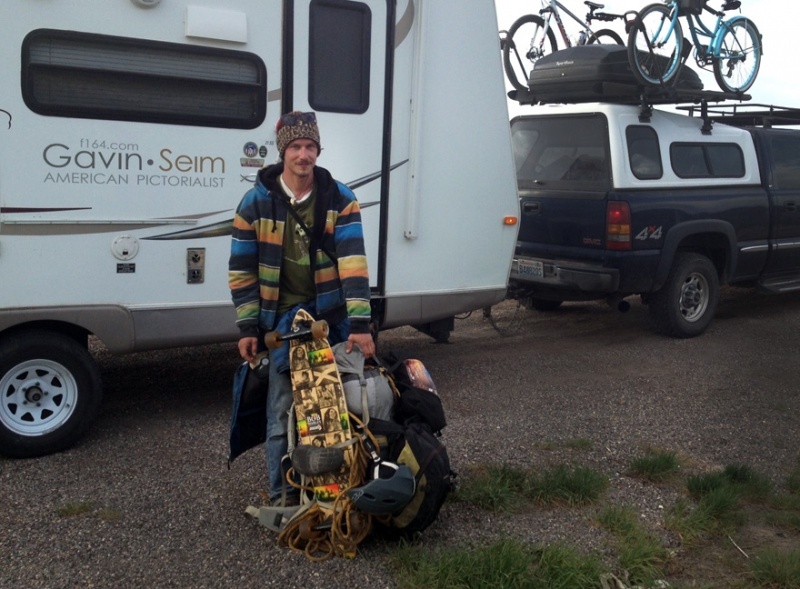 Until the next trip, Gavin Seim. Coming down from the Death Road new Zion. Amazing views. Picked up a hitchhiker from France named Tebu who’s roaming America. He’s headed for Moab. No room in the truck cab, but he fits in the back and his gear in the camper. This guy is hauling way too much weight. 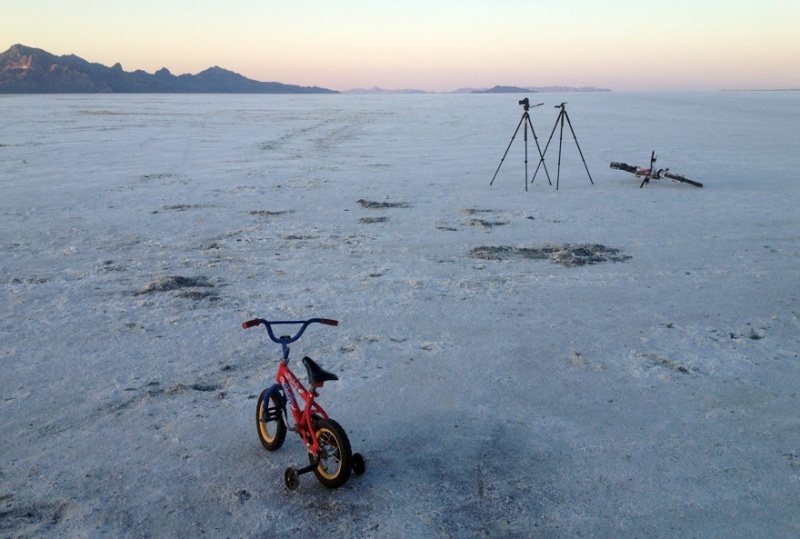 An evening at the Salt Flats. It’s a stark place. but grand none the less. The kids are hams. Just like dad. The last sunset, overlooking the hills neat Pendleton Oregon. We have arrived back home. After 91 days. Day 83-88, 04/24/13 – 04/30/13 – Radiator Springs, Death Road, The Fatali. Sondra has a new Wee Ride front carrier for the kids. Asher thinks he’s pretty cool up here. Wow, we’ve spent nearly a week in Zion area and every day has been beautiful. 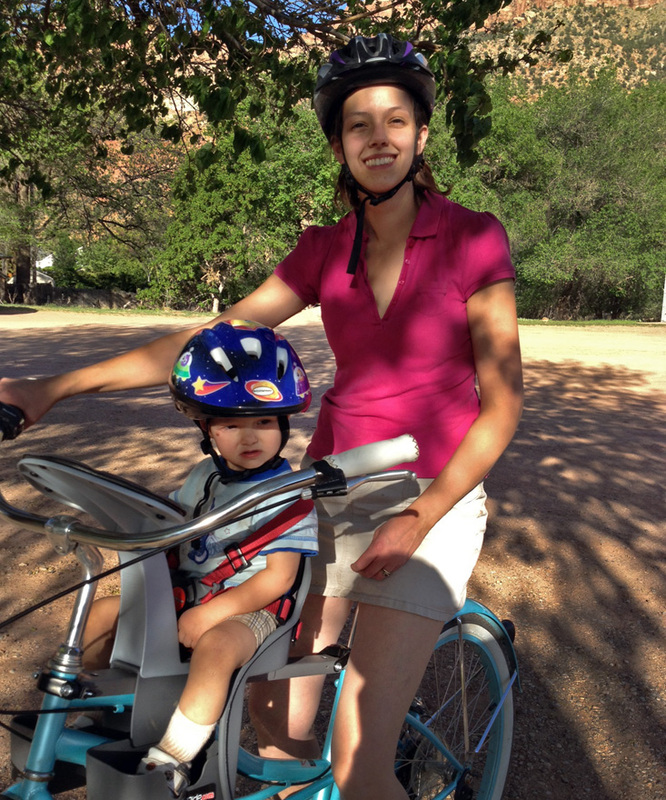 We’re heading out today but we’ve had days of light study, family adventures, evening drives and bicycle rides. 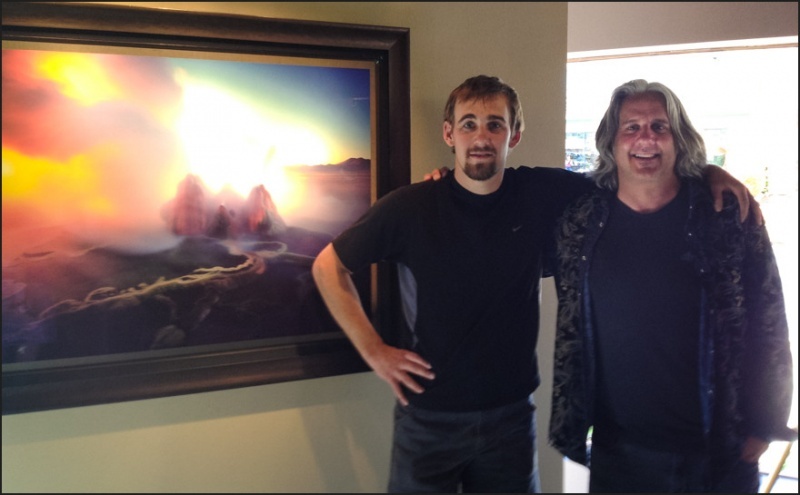 Turns out we were just in time for the opening of famed landscape photographer Michael Fatali’s new galley in Springdale and we got to chat with him in person which was neat. He’s truly a master at his craft and we stopped in more than once. Those that follow me know I am hard to impress with images. Fatali does it. I walk into his gallery and truly wish I had the extra money to buy these prints. I will be back. As for the radiator. I’m not sure I mentioned this, but we have been having some recently acquired trouble with the truck overheating when towing and coolant leaking a little as well. We finally took it in to a great little radiator shop in St. George and they put a new one in. $600 later she seems to be cooling like a champ. This has been a trip of repairs and we have put over $3000 into the truck on this tour. Painful, but it;s good to know things are running properly and the trip is will be profitable thanks to PHOTOGRAPHICS. We only have about 5 days left. Then it’s a week at Wall Portrait Conference in Yakima before officially settling in at home. It’s been grand, but stay tuned because we’re not done with our adventures just yet. 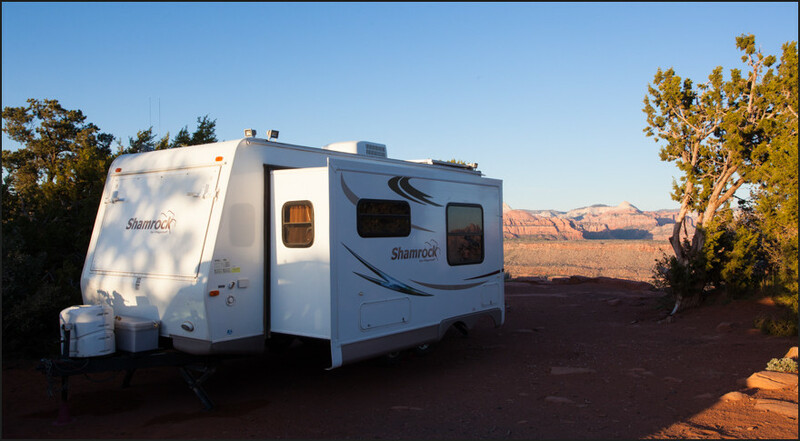 Speaking of which we’re about to hook up the Super Camper and head down from Smith Mesa. There’s a winding road up the side of the cliff that will get is there. We call it Death Road. But the whether is good and so are the breaks. It’s narrow, old has no guardrails and ends of a cliff. But we’ll be fine, the weather is good today. Fatali exemplifies the language of light, combining the science and the art of it in a fluid dance and finishing it with presentation that is utterly impeccable. Simply put, it’s one of the best galleries in America. The Super Bicycle.. 4×5 View Camera. Check. Film and lenses. Check. Digital SLR. Check. Sturdy tripod. Check. Extra water. Check. Trailer with kids. Check. Repair tools. Check. First aid. Check. Filters and more. Check. Solar panel charger. Check. Hunting knife. Check. A fine final night in Zion. But I feel rather like a mule. The kids are like. Hurry up dad. I’m like, no problem, I’m only hauling 100+ lbs of extra gear. At least the kids are skinny. We are almost at three months and will be home within about two weeks. It has been a great adventure once again. So many places, miles, smiles and even problems. But we’ve made life long memories, accomplished much and chronicled it all right here. 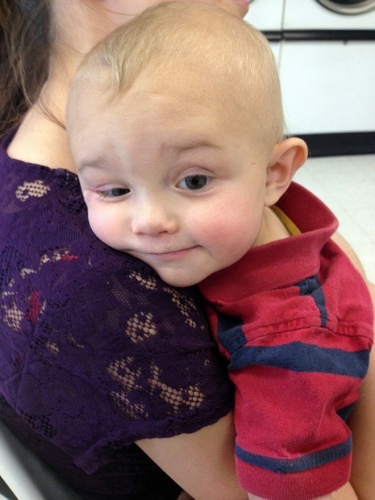 Landry Day – I think Asher needs either a nap or a playground. Maybe both. What exactly is the big news? So we’ve been filming for our project called PHOTOGRAPHICS. A movie about photography, history and craft. We just released the trailer, all made from the road. The film even got accepted to Kickstarter and is now in the pre-order stage. You can learn more here. After we left Colorado we headed for milder whether and sort of found it. It’s been a chilly windy Spring, but we found some grand places anyways. After going thru bits of New Mexico and Arizona and stopping for a stunning evening in Page, we finally made it into Utah. 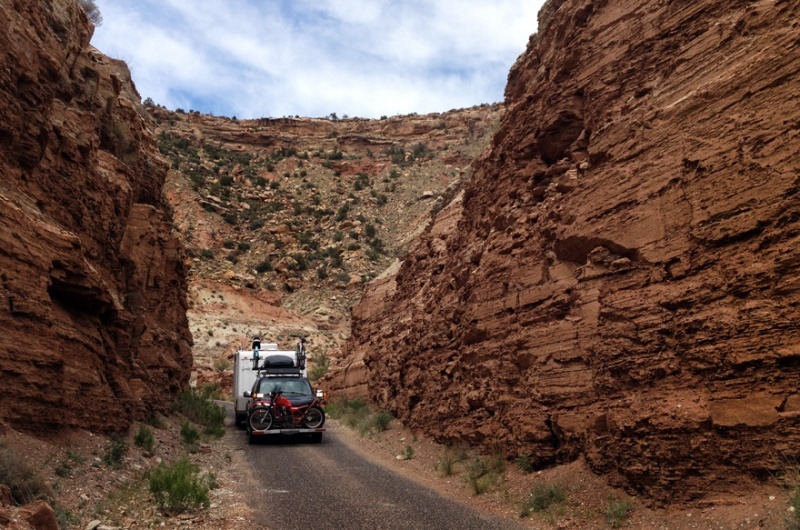 We went for the first time into the remote Grand Staircase National Monument. We took a few days getting across this huge, little used park. It’s wild and beautiful. In fact I believe I pulled off the best image of the entire year here. A panorama that I am thrilled to have gotten. Will post that soon. Next we headed through Bryce Canyon, Coral Pink Sands and then to Zion area. That’s where we are now, camped on top on the world at what might be the most incredible RV spot on earth. We are on the Smith Mesa, on the edge of a cliff, overlooking the entire Zion valley. It’s truly stunning. We’ll be here for a few days then moving on. We hope to find a few more grand places before home comes into sight, but we need to be back in time for the annual Wall Portrait Conference on the 5th. Not sure what route we’ll take home yet, but will try to make it a good one. Gavin having a productive morning at Horseshoe Bend near Page AZ. 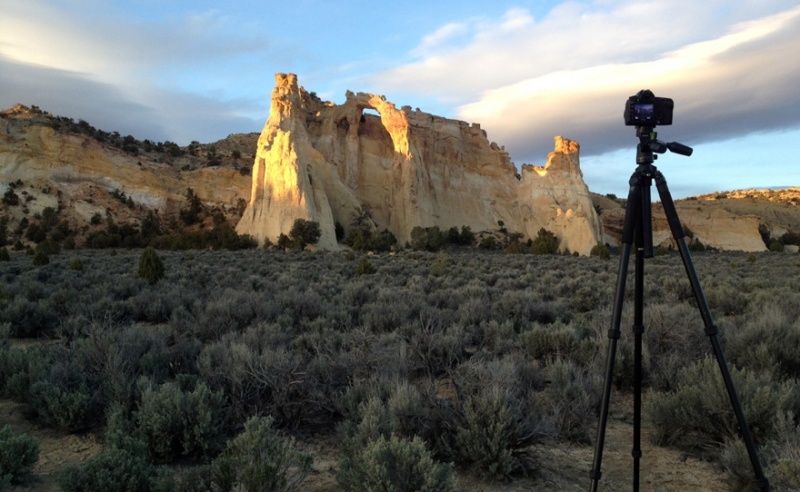 Beautiful sunset light in Grand Staircase Nat Monument. Wait till you see the result. Sondra looks good. She has a Marilyn Monro thing going here 😉 She’s such a trooper. More sand. The kids love it. Especially Cy. Coral Pink Sands this time. Top of the world. The camp spot we found in 2010 that overlooks the entire Zion valley. Good to come back. I spent some time cleaning up the trash around here. You can find this listed on the maps page. Had to show another view from sunset. What a place to setup camp. 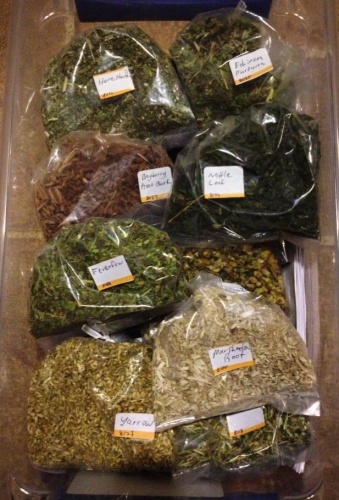 Day 62-72, 04/05/13 – 04/14/13 – Texas Jets, Sandy Mountains, Herbal Remedies. We went to Lubbock and visited with fellow photographer Jody Smeyers. He and his family were great hosts. 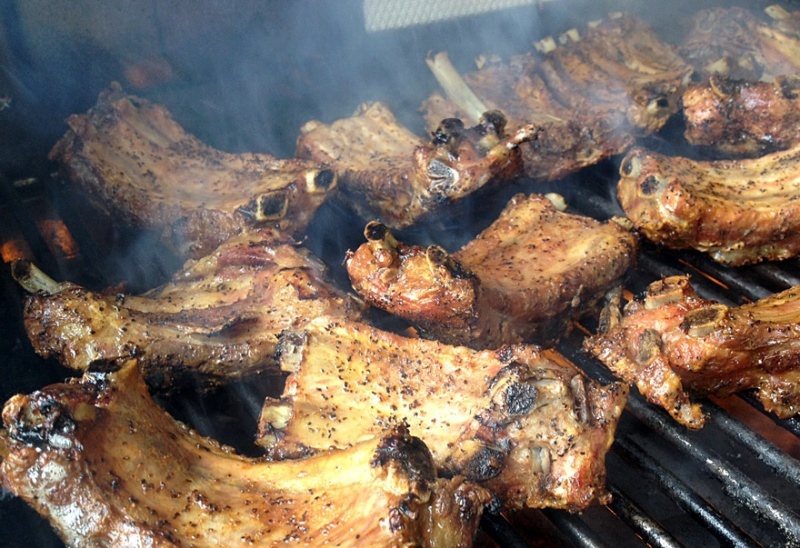 He even made us some of those famous Texas style ribs, we saw the sights and even manages to photograph a F35 fighter jet. More on that here. We now have good stock of herbs to cover everything from fever to bleeding. 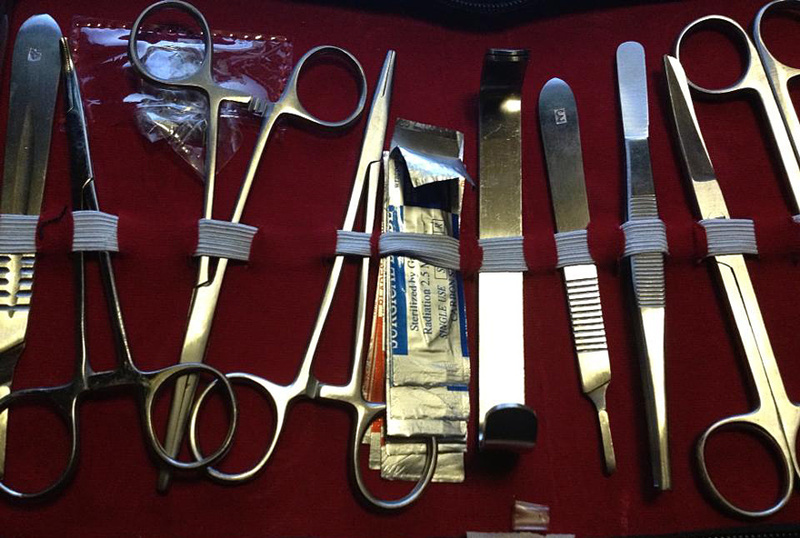 The primary med kit is also well stocked. Click for larger image. One day it was 85 degrees around here and the next it’s cold with snow predicted. There’s a huge weather system moving across this entire region and I don’t think we can escape it. We’re trying to move around it, but that’s not easy. We also discovered powered Gatorade, or as the kids call it, Blue Juice. 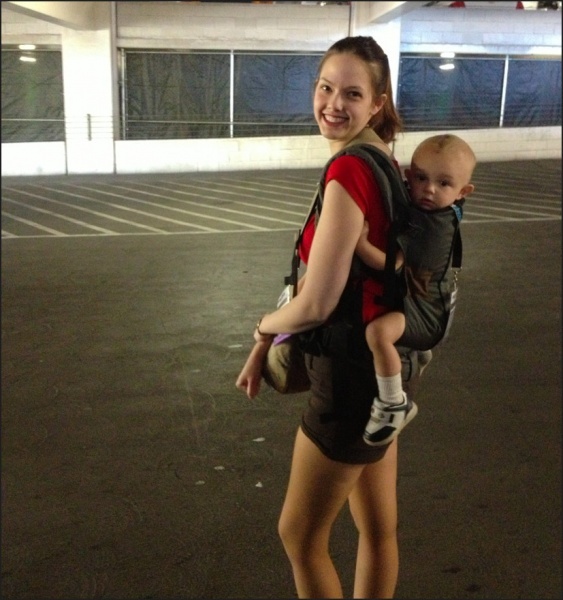 It’s much cheaper and easier to carry. Good times. When it’s cold you hunker down in the Super Camper. Sometimes things get crazy. 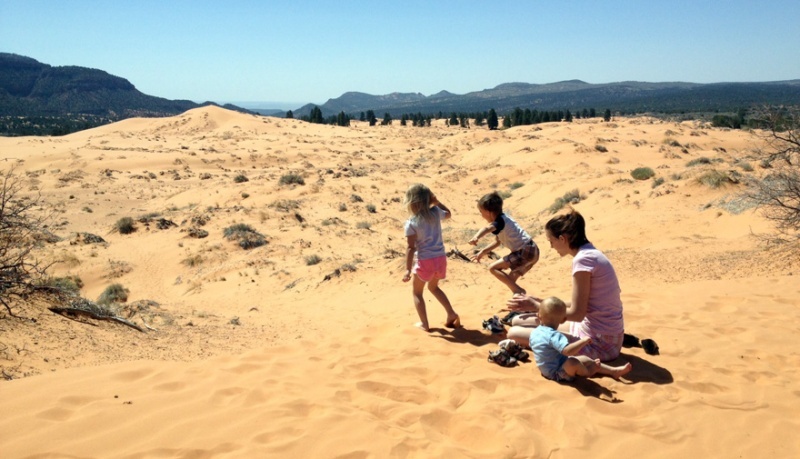 We came up into Colorado and spend a few days near Great Sand Dunes NP. The dunes are truly huge and backed by snow capped mountains it’s really pretty up here. It was looking warmer, but now the cold and wind have again moved in. We’ve still had fun roaming the area, though I did not get to explore the dunes as I hoped due to the whether. Yarrow for example is good to reduce fever. It can also reduce bleeding, including internal bleeding. Horehound is useful for respiratory issues. Chamomile calms nerves. Feverfew is also good for fever as well as headaches and other pain. Marshmallow root can be used among other things as a disinfectant. Nettle Leaf for sore throats and lots of other things. The list goes on. Fresh herbs would be ideal, but these you can have ready at all times. It’s Sunday. This morning there was a spotting of snow and more predicted. 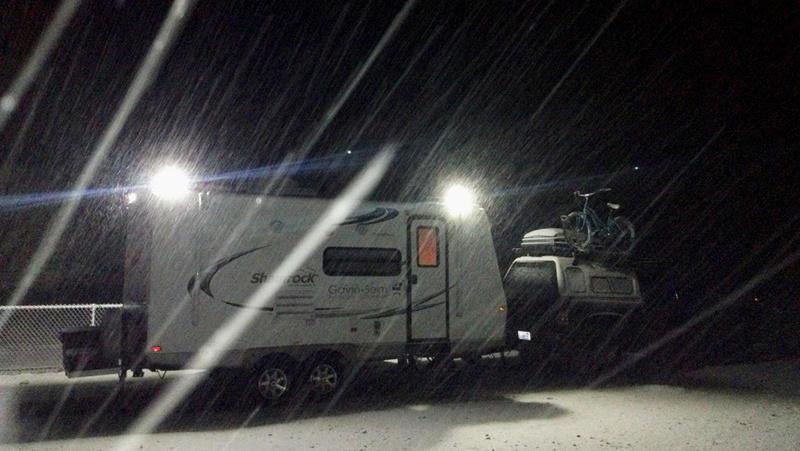 We were planning to head west thru Colorado, but driving the camper in the snow is not very fun. We’re going to cut down out of these mountains a little and move west towards South Utah. According to our maps that should keep us out of the worth of the weather. We’ll see how we do. F-35 Lightning taking off from Lubbock International, April 2013, More in this post. An amazing dinner from Jody and his wife Jan. And the leftovers made an amazing dinner the next night. Good stuff. 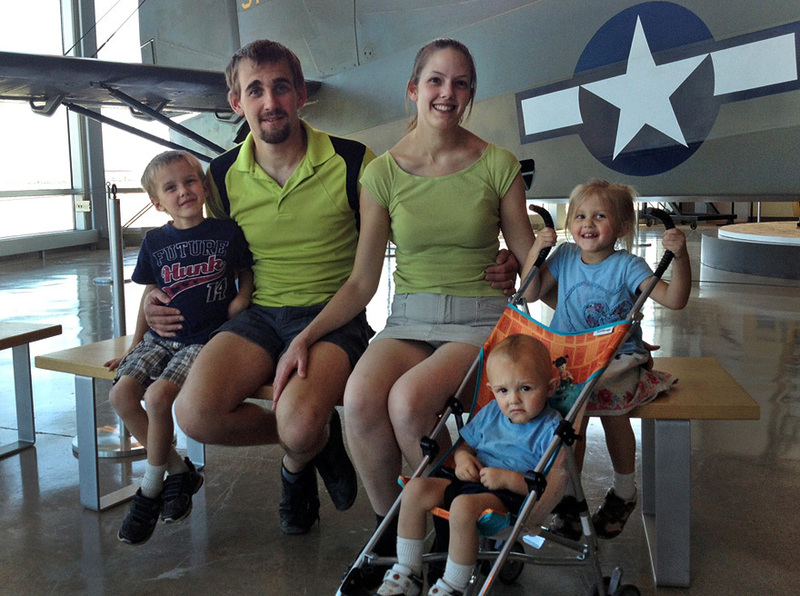 Enjoying a bit of history at the Silent Wings museum in Lubbock. The final day we photographed the f35 using the camper as a base while we waited. Fresh coffee before heading down the road. Had a beautiful sunset the first night in. 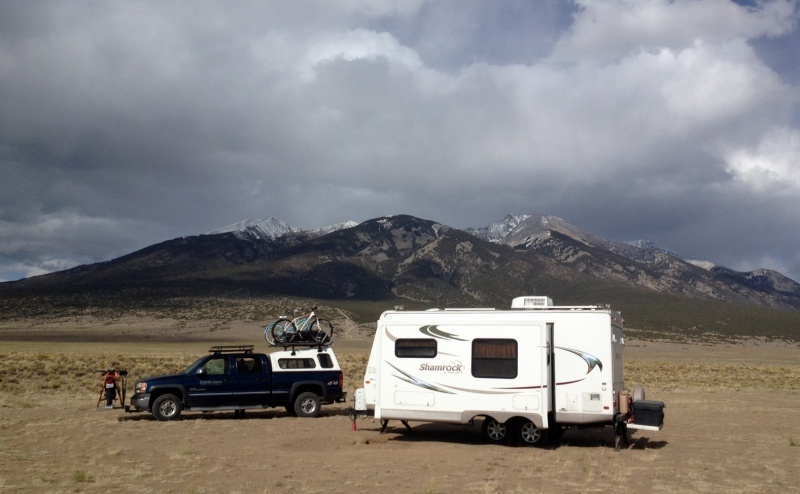 Sadly the weather had been getting worse, but this is a stunning area up near Alamosa CO.
Our camp near Great Sand Dunes NP. Free of course. Location is listed in Maps. Coming down from Sedona to traveled a few hundred miles further east. We had told Cy we would go to White Sands again this year. I was not going to go back on our word to save a 500 mile trip. Besides, it’s stunning here. There’s nothing like the White Sands. We’re glad we came. Sledding in the sand, flexing our freedom, good times. We had quite an encounter with the Border Patrol on the way in. I have this thing about the Constitution and freedom and the excludes my family being stopped in the highway for no reason. We recorded what ensued as they detained us for a few minutes and the resulting video has been getting a lot of interest. I finished a new image from Sedona, the first official signature piece from this long trip. Check out Sedona Nights here. Made what I think will be some good images in White Sands as well. The rich pastel colors of morning here are like nowhere I have ever seen. We’re moving on today. I think we’ll head up to Lubbock and then cut back across Colorado and Utah for the month we have remaining of this tour. It’s been quite an adventure filled with highs and lows, but stay tuned. It not over yet. Stay tuned. Gavin giving a speech to the camera while being detained at an inland border checkpoint. Adventures abound. 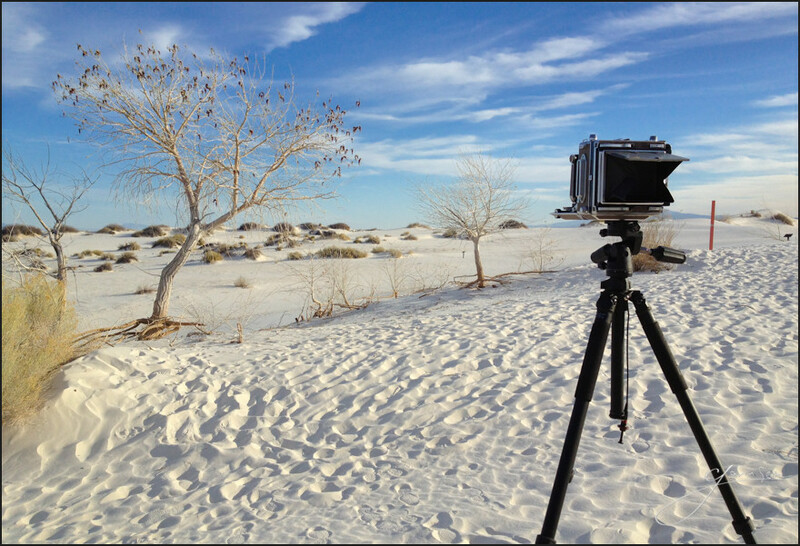 There’s nothing like the pastel light during sunrise at White Sands. Hoping I pulled a few good on the view camera. 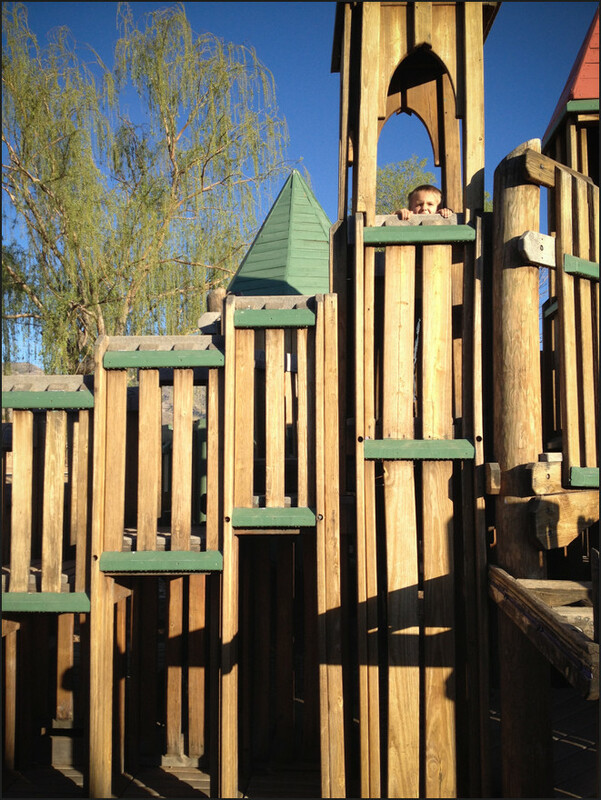 We found the motherload of playgrounds in Alamogordo. I’ve seen this style before, but this one was HUGE. The kids loved it. Cyrus love the Hasselblad. 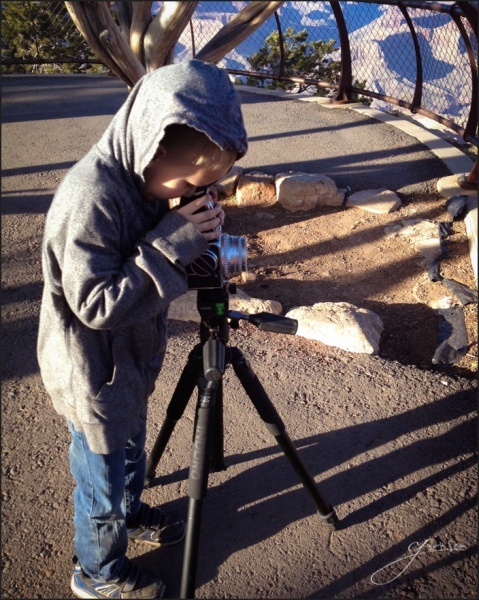 He’s working away at the Grand Canyon. I’m losing track of time. I now come here to find out where we’re at. 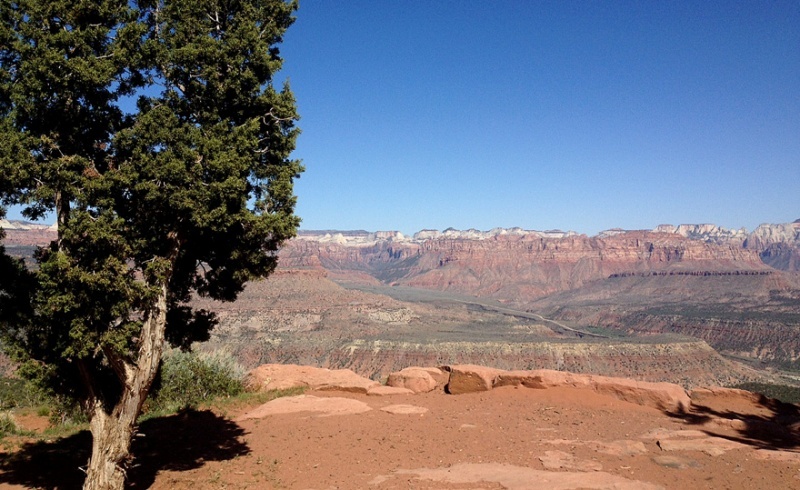 We spent nice days around the Grand Canyon in our newly restored camp spot before moving on. Enjoyed wandering around with the kids. They love life so much. Moved down the road from Flagstaff area. It was pretty cold. Headed to new adventures in Sedona. Beautiful countryside. A strange town though. VERY busy. We found a spot to boondocks about 10 miles from town and two more campers were sharing it with us by the next day. We did fine though and enjoyed the sights. I may have even captured a new signature image. Time will tell, but we had some good times and I recorded some good stuff. Are you saying the candy is GONE? The Coconino National Forest that runs the area is appalling. I even called and let them know this – These thugs charge for parking permits all over the popular areas, even though it’s specifically forbidden in the National Recreation Act (HR 4818 Sec 108, D, 1, A) and has been affirmed by Federal courts. They simply ignore the law. Why the locals tolerate these crooks is beyond me. Don’t pay simply for parking folks. Most areas do not legally need a Red Rock Pass. Read the NREA and call them on it. If we have to obey laws, so do they. I will not buy a pass to park in my lands and I will park in them. I dare the Forest Service to cite me for it. That’s a lawsuit I can win. Because they keep getting sued for it and losing – OK rant over, for now. I also got a mountain bike. Now both the cool spaces on the truck are filled. I was holding out because I wanted something better than a box store bike. 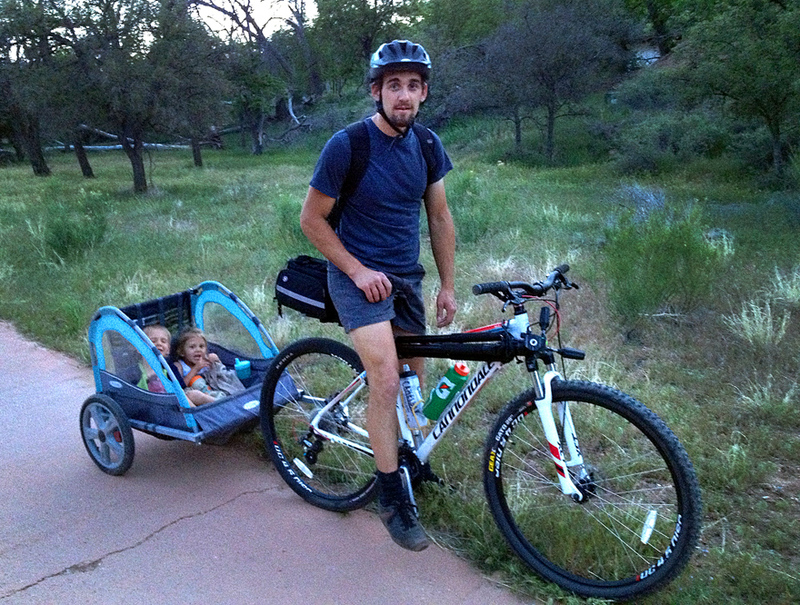 My waiting paid off with a Cannondale Trail 6 29’er that I picked up at a local Sedona shop called Over The Edge. It was one of last years rental, but has been well taken care of and even got a tune up before I took it. I’ll add a photo below. While out exploring one day we were parked on the side of a rutted dirt road and a man stopped and jumped out. Turned out it was local photographer Larry Pollock who follows me online. He saw the truck and said to his wife “I know that guy”. I guess we stand out. We left Sedona yesterday after a delicious round of Pastries at Wildflower Bread Company. Got about 30 min out and the alternator on the truck failed. We managed to get back to Cottonwood and visit a parts store before the batteries died. Drove to the WalMart parking lot and installed it in the dark. Having a good selection of tools in the Super Camper pays for itself again. She’s back up and running. Back on the road again today. Good times, good images and good progress on the new Photographics Film. Stay tuned. Gavin’s new bicycle. 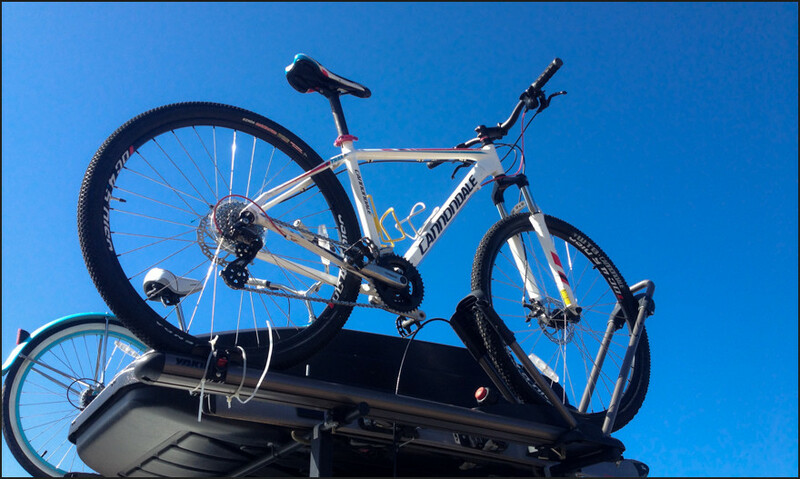 A 2012 Cannondale Trail Six 29. The view from camp. 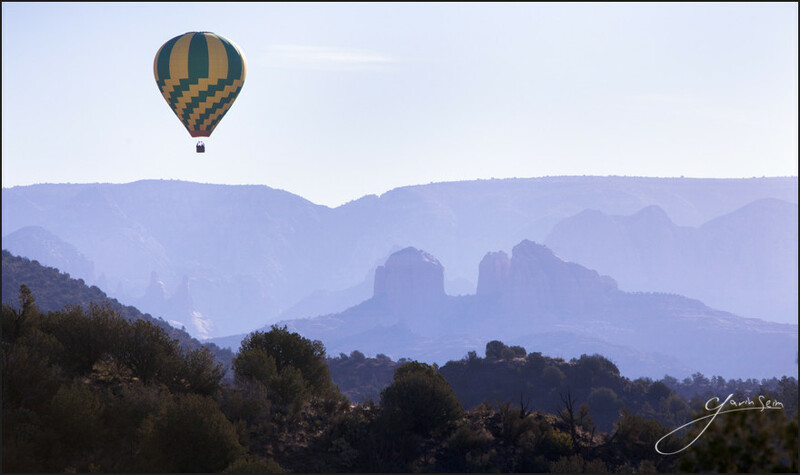 Morning haze is contrasted by the touring balloons from Sedona. The kids enjoyed it. Cy, Ana and Asher enjoyed the truck converted into a PS3 racing simulator at a local Army Surplus store outside of Flagstaff. 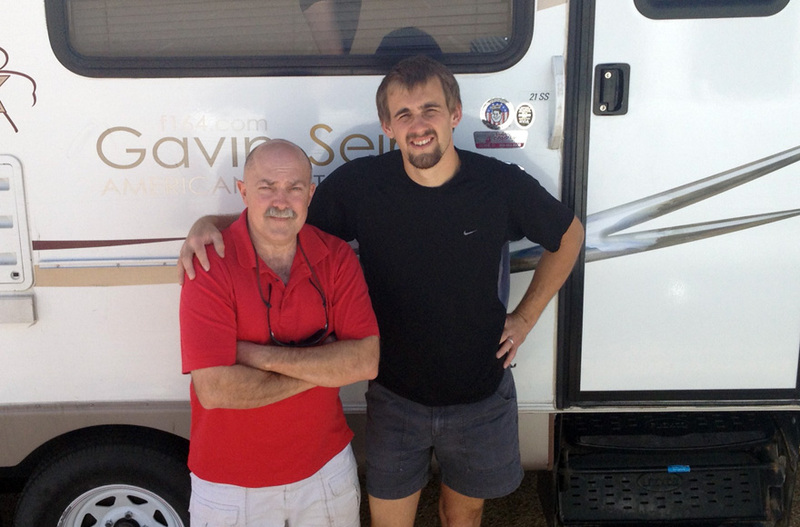 Day 38-43 – 03/12/13 – 03/17/13 – The Strip, The Canyon and Campsite Restorers. Sondra was a trooper hauling the kids around WPPI. So were the kids. Good times. 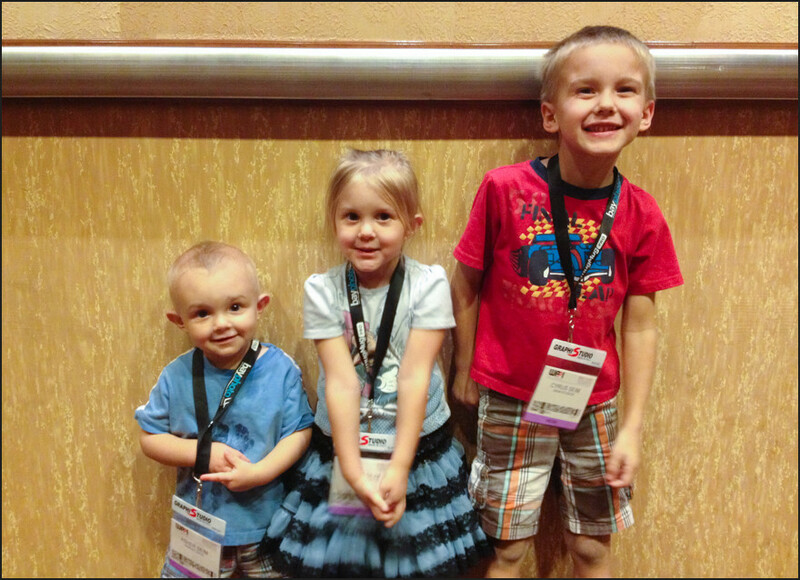 We spent 3 nice days in Vegas for WPPI. It was a fun time. We all spend some time on the trade show floor. I carries the 4×5 and it was the best conversation piece at the show. WPPI was not very friendly to kids and that was a hassle, but we managed and I did not hesitate to let my options on the matter be heard. WPPI has reached out to me on the matter and we’ll see if they can do better next time. 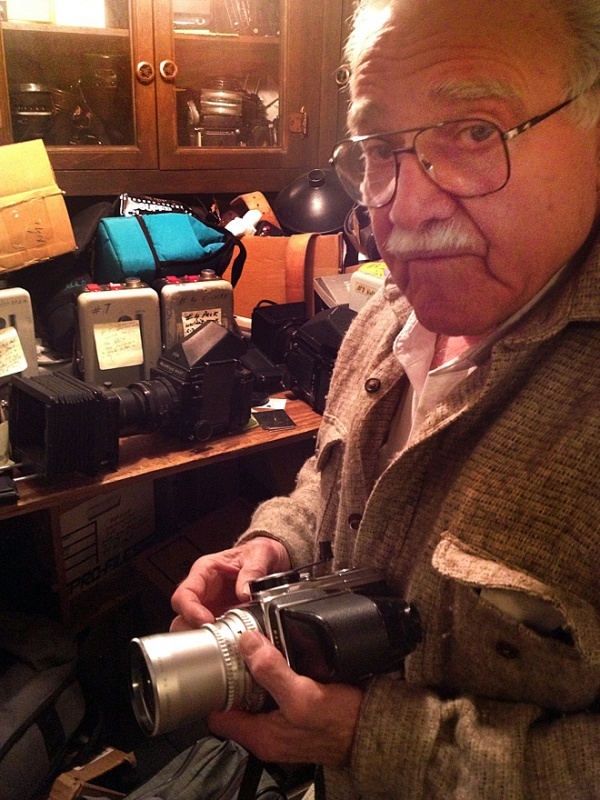 On the last day I even got to setup and make a portrait of legendary photographer Jay Meisel. Thursday ended around 1PM, we afterwards we packed up and spent an evening down on the strip with the kids. We saw a few neat places, including the castle (Excalibur) which made the kids happy. We even visited the Peter Lik gallery at the Venetian and the crew their quite enjoyed the fact that I was carrying a Hasselblad. Vegas seems to get more seedy all the time. We saw the sights and it was fun, but Friday we took off, camping up along RT66 as we headed towards Flagstaff. Yesterday we opted to stop over in the Grand Canyon for a few days since it’s been a couple years. We found a forest camp that was really close and free to boot. It was a mess though so we spend a few hours renovating it and now it’s a fine camp. A video of that below. We’re enjoying the mild whether up here and will move on in a few days. 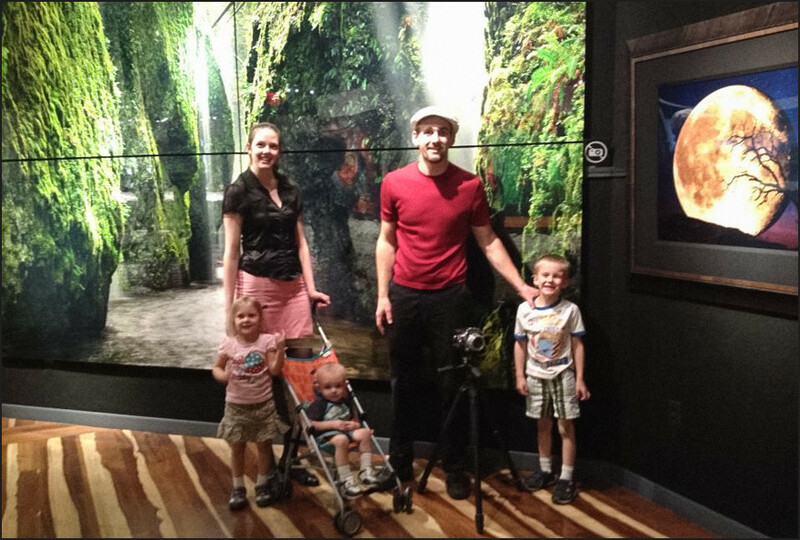 The family in front of a giant wall print at the Lik gallery. Not a great photo, but I got permission to take a quick one and had another guest grab a snapshot. We made it to Vegas today. The hard part was finding a camp. We had scouted a place on some BLM on the outskirts of Vegas that we planned to use. But it was not very secluded and there seemed to be a squatter living about 100 yards away. Maybe fine for one night, but seemed a bit exposed to camp for days and leave it alone. We looked around. If we went out further it was no problem, but we wanted reasonable access to town this time. 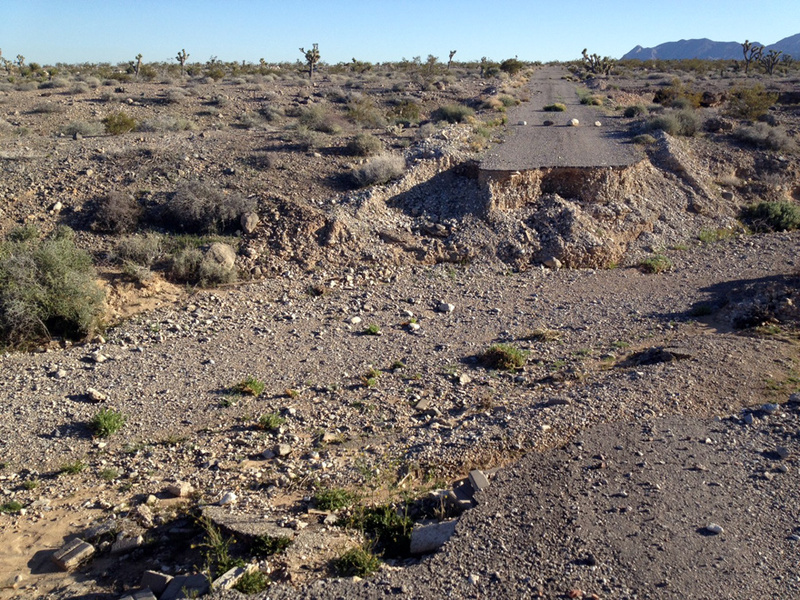 We hunted around finding mostly bad roads leading out into the BLM land. We got into a couple of bad ones, but always managed to get out. 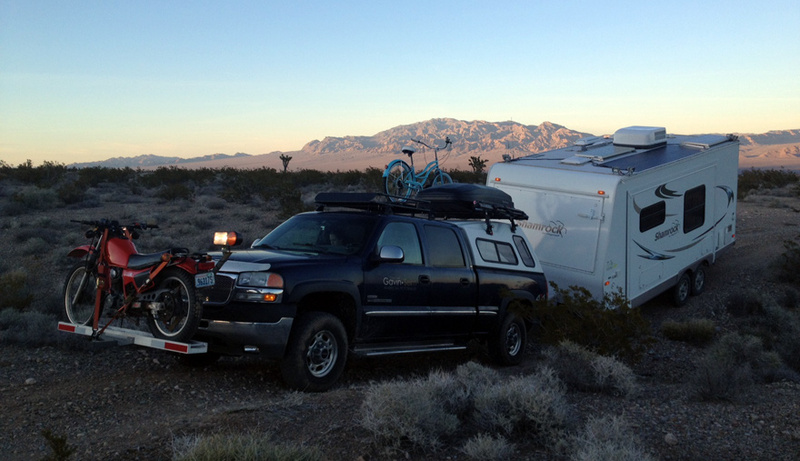 Finally it was getting dark and we decided to check for RV parks near the strip and found they are not too spendy around here. We drove to a park called Kings Way which is only a few miles from the convention. The office was closed however and no instructions posted. Odd. Still there were open spaces and it said $16 a night. We just settled down and we’ll square up in the morning before heading to WPPI. See you there. We hope to meet some of you there and I plan to roam around with my 4×5 so watch for the guy with film cameras, a bunch of kids and a beautiful wife. We hunted on the BLM areas closer to town, but the road network was a bit lacking. Even the Super Camper can’t take this one. At least not until we devise some sort of anti gravity plating. I really need that. Too much work for a camp spot. We actually made it past. But the spot was not exciting enough to warrant a driveway this rough. Look, you can see our roof. Whew, I’ve been bad at updating. But we’ve stayed put all this time. 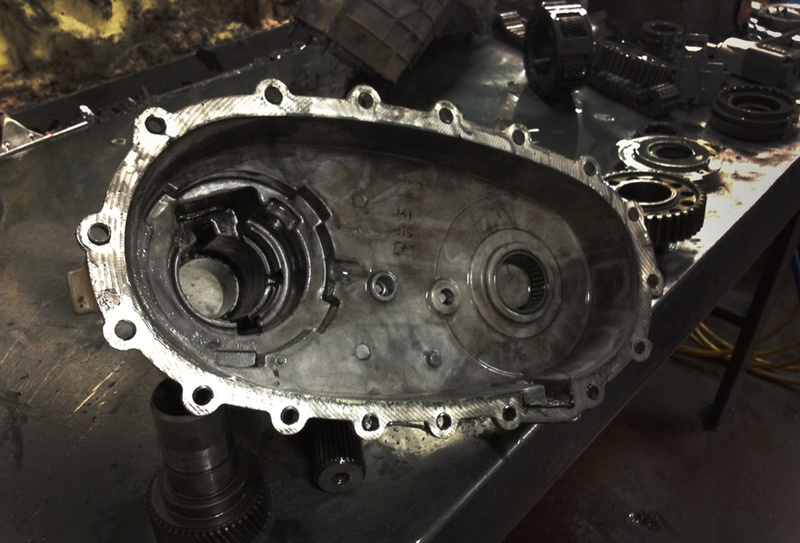 We did get the Transfer case done. Took it to a place called Denny’s and they rebuilt for about $1800 including a new yoke which had been damaged. Not cheap, but we saved about $600 going this way. 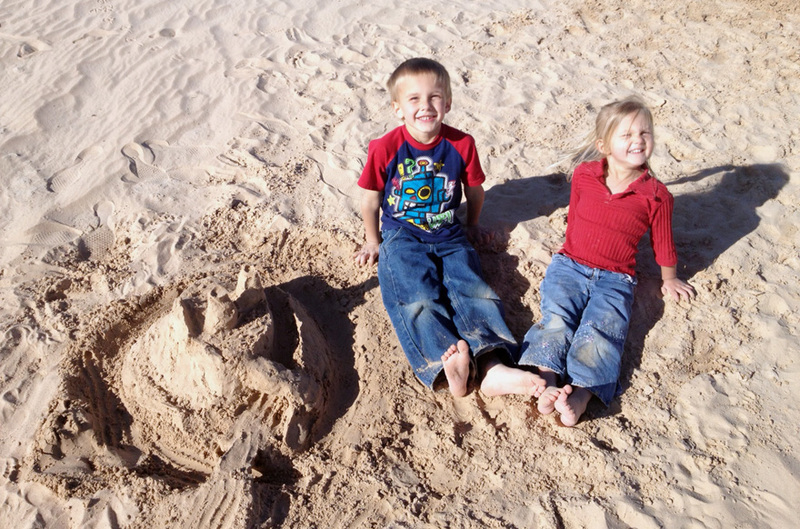 It was mostly a warm week with some nice drives, yogurt runs and playgrounds for the kids. No amazing new images made, but I finished releasing a brand new presets collection for Aperture called ColorFlow and the improved internet on our newer 4G mifi helped a lot. During the truck repair we rented a car from Enterprise. I got a 2013 Town & Country. Sondra and the kids loves it. I was glad to have my truck back and especially to have working 4WD. We need that out here on the road. We had a real storm near our final days with some record area rainfall and a good bit of hail as seen in this video below. We came home from a run to Lowes for some hardware and found water had been running under the camper and down the roads. It’s probably a good thing we were gone because we might have fled to high ground had we been there. We also got some packages in including an amazing stove stop espresso maker and some new drawer latches that may actually work. I’ll post more about both later. Today we’re heading our to move towards Vegas and WPPI. We should make it as far as quartzite. Torn down. It was really bad inside and the rear half of the case gas to be replaced. But they were still able to rebuild for less than buying a refurb. A visit to Superstition Coffee Roasters was a pleasure. Bill the owner talked shop with us. 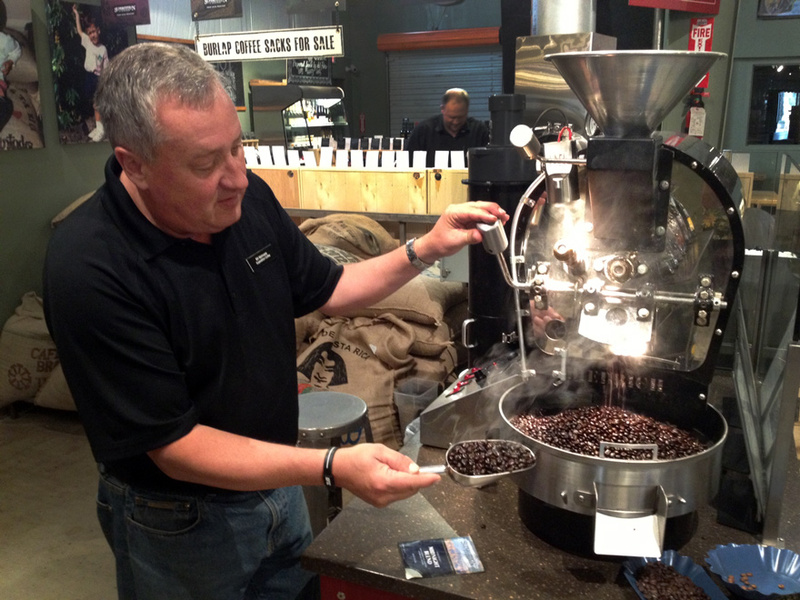 As a hobby roaster myself it was neat to chat with an expert who’s been in the biz for longer than Starbucks. 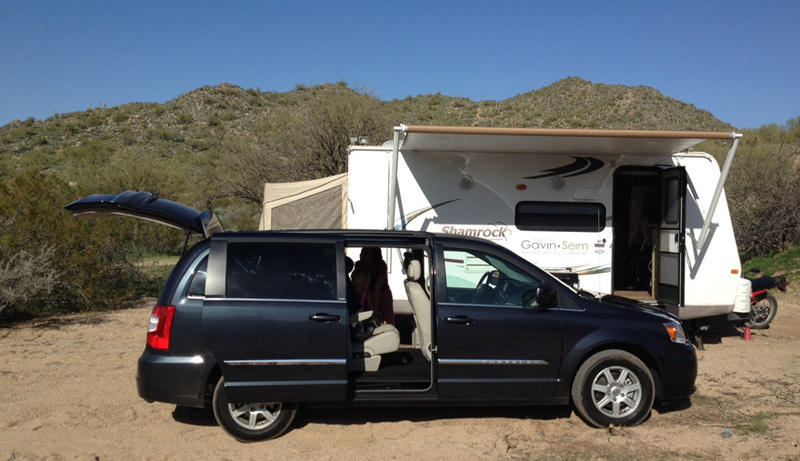 Not exactly a Super Truck, but our rental of a Town & Country was a smooth ride and it made the wife happy. Problem is, now she wants a minivan. 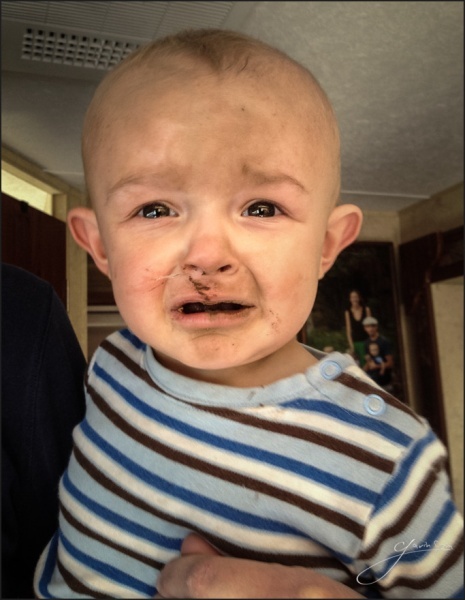 Day 26, 27, 28 – 02/28/13 – 03/02/13 – Nurse! Scalpel, Forceps, Yogurt! It’s been a calm couple of days. I’ve spent a good deal of time running around planning to get the transfer case on the GMC rebuilt or replaced, as the 4×4 is not working right and we know it’s going. It’s going to be costly, but it needs to be done. We’re going to try the rebuild as it looks like it will cost closer to $1000 instead of $2000 for a replacement unit. We’ve had a few nice drives around the area. Very warm weather, play areas, a run downtown yesterday for a visit to a yogurt bar. We love those. The good ones have frozen yogurt your with your own toppings (generally fresh fruit in my case). I think I honestly like it better than ice cream. Supplies came in today – A bunch of things I had shipped from back home. After they stockpile for awhile Nathan sends them out to us at a local shipping store (they will generally let you receive packages there for a small fee). Among our package were lots of little things, including some fresh Stargate DVDs for those quiet evenings in the camper, a new MiFi which seems to be really helping our internet speed and even some new goodies for the Super Camper medical kit, like these instruments, some new sutures, medicines and even a skin stapler. Ya, that does sound painful. We’re feeling better and enjoying the warmth. Once the truck is done we’ll probably move on. We don’t want to grow stagnant sitting in one place. But for now, the slower pace is wonderful. A military style instrument kit we found on Amazon. Good stuff for our medical supplies. We made it. Phoenix area is warm and tranquil as it always seems to be. We settled up in the Bulldog Canyon area and plan to stay a few days. I need to have the truck looked at and hope to enjoy the scenery and access to supplies. We’re even having a few things shipped into a local shipping store so that we can fill a few requisitions. Went for a nice drive this afternoon and I even called and scolded the Tonto National Forest a bit for having FEE REQUIRED signs where they should not (as per the National Recreation Act). This is our land. It’s time start demanding the government follow the rules too. Now it’s off to town for a few errands and some Crazy Bread. Now that’s camping! Last night we rode late. The family is still coughing but we’re getting on track and I can think straight again. I hate that foggy sick mind feeling. We stopped at this remote area in the Nevada last night after dark. I saw a lot of plants and cactus and woke to light and one of the most colorful deserts I have ever beheld. I’ve been all over the Southwest and the flora here was stunning. I setup the scene below and did some recording for the new Photographics film – No, it’s not a sound stage. This is actually the desert. We’re moving on again today however as the weather keeps improving and I have what I need from this colorful camp. We’re going to make it to Phoenix today. This was not a bad Monday actually. I sweated out the night but finally got to sleep. I woke, not feeling perfect, but feeling a good deal better and like I was actually recovering. Been keeping up on the fluids, vitamins and eating. God is taking care of us. I was actually surprised how much better I felt this morning. The world looks a bit brighter. No matter that it’s Monday. We’re going to move on from here. It’s getting better but chills and wind still seem to be following us. Time to ride. I slept lousy last night and mainly sat around camp today but am feeling a bit better. Still dealing with the fever but my appetite is coming on so that must be a good sign. We’ll see what tomorrow brings. Last night I started feeling really poorly again and this morning it’s not much better. Sondra is improving but it seems my round is not over. The only thing worse than being sick is doing it in a tiny camper while on the road. I’m feverish and just trying to get some rest. Sondra is taking good care of me though and she’s run into town to run some errands. 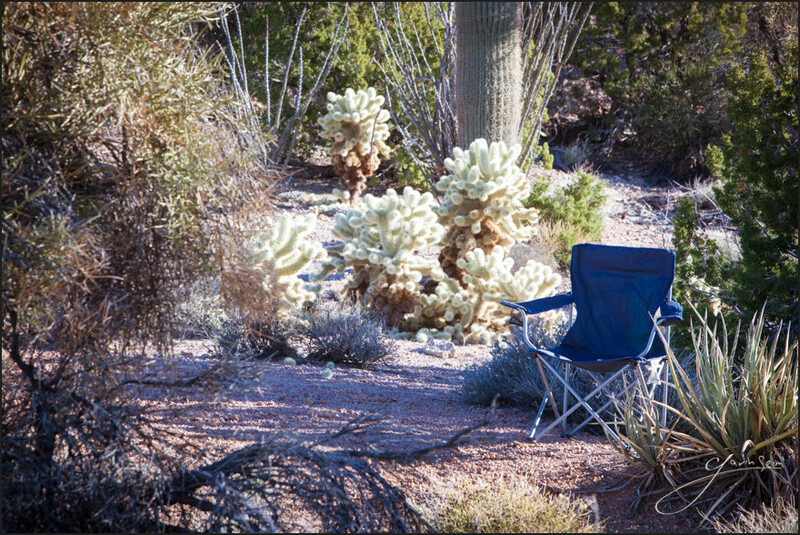 We made it just over into Arizona last night and found a nice secluded spot in the hills where we made camp. The day dawned well and we seem to be feeling a tad better. I hopped on the Honda and went for a ride around the old roads. There’s no one here, but I did find a bunch old, old mines. Apparently people have done a good deal of prospecting up here. We’ll stay a few days so we can relax and hopefully get warm whether and head back to town for some errands and a much needed laundry run now that we’re settled. 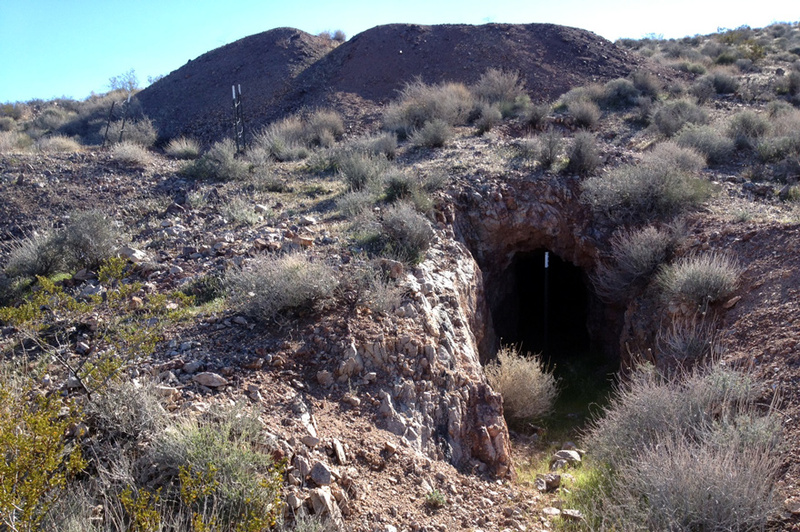 What appears to be old mines on BLM land just across the Arizona border. I roamed up in the hills on the bike and found many like this. But they look as if they have been vacant for years. Is there GOLD in them hills? Literally! We found a spot in the hills of the highway to camp out. Neither of us are feeling great this morning, but we’re still standing. I noticed the trailer had a flat and popped it off to find the wheel destroyed. Almost like the metal had been ripped. – I have no idea what we could have hit to cause this. 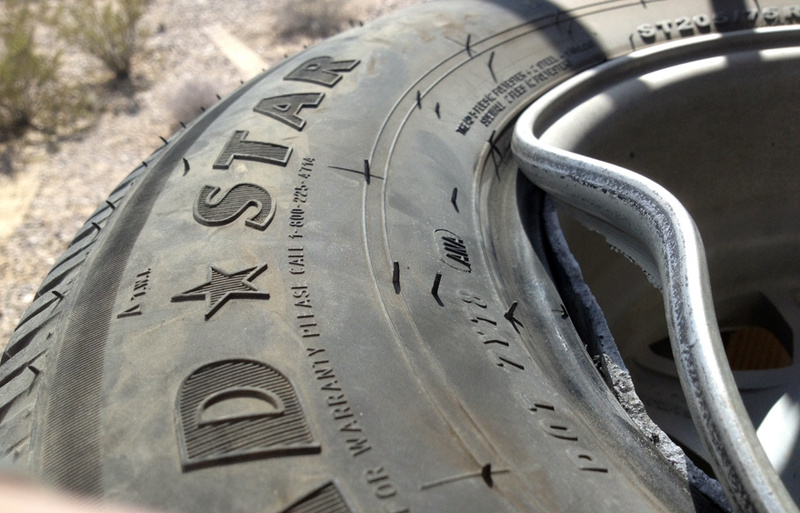 We loaded up and went to discount tire and found a generic rim. We have a spare again now. I’m going to order a couple OEM wheels that match so we have them in the home supplies, but we’re still moving for now. Did some shopping and now we’re getting our of Vegas. There’s not much to see here. Moving on down 95, tired but confident we’ll be feeling better soon. Not sure what happened, but it was broken like this in two places. Pretty crazy. Even the tire shop was rather surprised. We bolted on the spare and bought a plain rim to replace this one until we can get an OEM. Sondra was pretty under the whether yesterday and I can feel it coming on me today. I don’t like it. The kids are coughing and hacking to. We’re going to have to take it slow until this passes, but sadly we’re still not our of the nasty whether so we can’t lie out in the hot sun to recover. This presses us on. We discovered Big Dune this afternoon and it’s neat, but the wind is really bad so we’re going to move on. I just feel like sleeping. Just a scouting photo. I did some better work and we plan to come back again. This is a solid spot and these dunes are huge, dropped out in the middle of the desert. DAY 18 – 02/19/13 – SNOW! We kept heading down 95 but instead of warmer whether it got worse. We hit a good bit of snow tonight and I decided to play it safe and stop. We hunkered down at a remote rest area and had a nice hot meal of Orange Chicken. Sondra is not feeling good. Its seems the head cold is going around the family, even though we’ve been loading up on vitamins. Snow in the mountains along 95 made for slow travels. So we just stopped. It’s safer that way. Stopped at Cabela’s outside of Reno and had a slow day before getting our of town and heading up to hop on HWY 95 so we can head down. Hoping for warm weather. 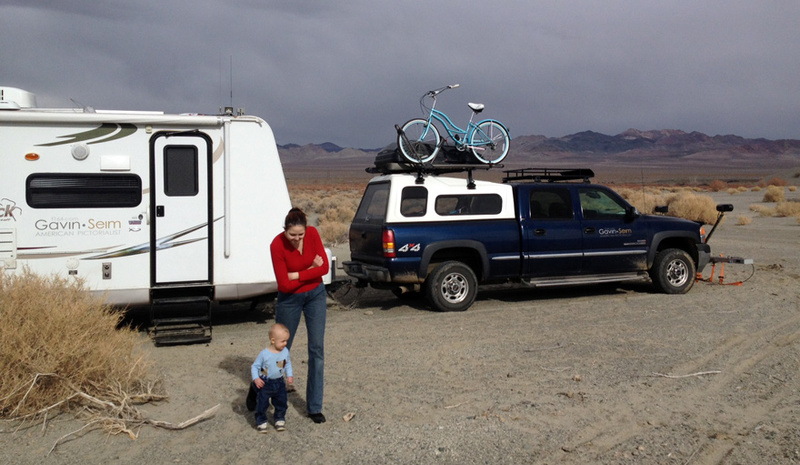 We found a spot in the dark to camp out in the NV desert. It tuned out to be nice. BLM land is generally the easiest to boondock on. There’s lots of it and its public. We use an app like NeoTrex to find land boundaries. 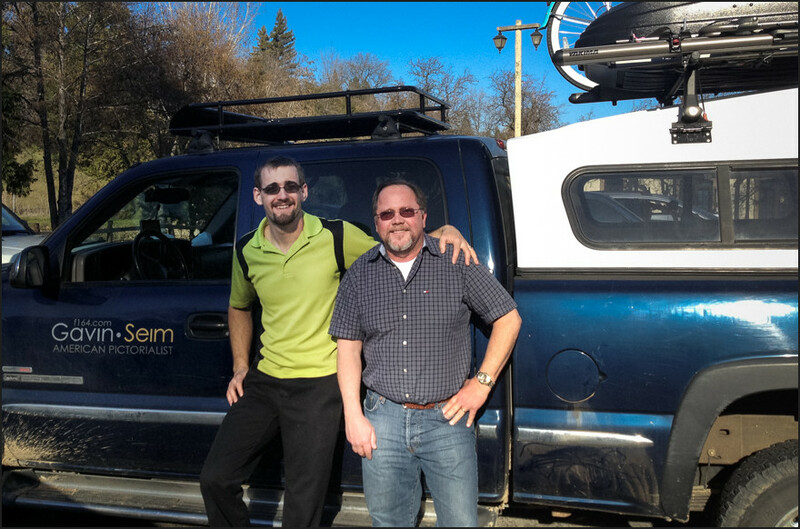 We stopped in Placerville see the sights to visit a fellow photographer who follows my work. It’s always fun to put faces on the people that you chat with online. Craig learned about me by watching EXposed workshop and he reached out when we were in CA. We camped on some BLM land out of town and headed in for a nice afternoon visiting the Gold Country Artist’s Gallery where he shows some of his work. We all browsed the historic town, had ice cream and talked shop. Good times. In the late afternoon we moved on and Headed over Donner Pass on dry roads into Nevada. Gavin with Craig K. in Placerville CA in front of the Super Truck. There’s nothing like being on the open road. I went our early in the morning and did more filming. Had some sun filtering clouds and nice light. I think I actually recorded an entire opening chapter for the new film. Back at camp we loaded up. After nearly a week in one spot it took a bit longer to get the creaks and groans taken care of and everything loaded up. We’re moving on to the north a bit so we can cross over into Nevada. This California place is expensive. The open road awaits. Loaded and ready. The Honda gets strapped securely on the front and everything rides nice. Today I got the new switch in the truck. The transfer case is wearing, but honestly it sounds fine and I’m pretty sensitive to noises in my truck. If it breaks, we’ll fix it – Life goes on. The truck shifts fine now and nothing is rattling around. We were also able to record some nice footage tonight for the new film. Now we’re rolling, not just planning. It was much later in last year’s trip before I really started filming for EXposed, so we’re ahead of the game. We had a productive week here. 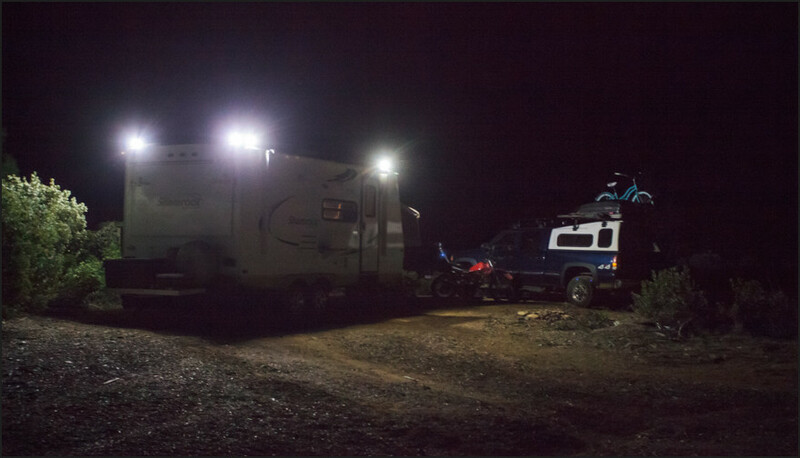 I installed new flood lights on the Super Camper, made some repairs around the house, took care of the truck and got some good images and footage. Lets roll. Sondra has started helping me with filming. She’s learning to run the camera and also makes a great model for light test snapshots. We pulled some nice footage next to this tree. I should have stopped to make a proper portrait of her. She looks so cute. The bearing came in for the truck and I took it to a transmission shop to get installed. Total cost was under $200 for that fix. Problem is they found a loose main shaft and have determined the transfer case needs some serious work. I’m thinking on that, but it’s not rattling around in there so we may wait a little till there’s more room in the budget. It’s all part of the adventure. With that sowed up I headed down the road only to find that the transmission was not shifting. I went back to the shop and they scanned it, determining (non related to the other issues) that the MLPS switch is failing, putting the Alison into limp mode. The good news is the transmission works. The bad news is I have to take it in again tomorrow and we’re out a couple hundred more. Looks like we’ll be here another day. Oh and I still have not got the filming finished, we’ll try tomorrow. I did enjoy a nice forest sunset on the way back to camp however and got a frame on the Hassy in this stunning grove of old trees. A sunset grove of old trees up near Bartlet Springs Road. We’ll see how the finished image comes out. I just took one frame. We were going to do some filming tonight and head out in the morning. But running some errands down in town we encountered a problem with the truck – It seems a drive line carrier bearing is broken up and the shaft is riding on the metal brace. Not good. I stopped at Napa and we narrowed it down with the help of Mark. The part will be in tomorrow the 14th. We limped to camp and I used a ratcheting strap to bend the bracket into a better potion. Tomorrow I’ll make my way to town for the part and find someone with a press that can put it on. I also picked up a new pistol grip for our shotgun making it smaller and lighter. It’s mounted securely in the camper. We had a little self portrait fun after dark. 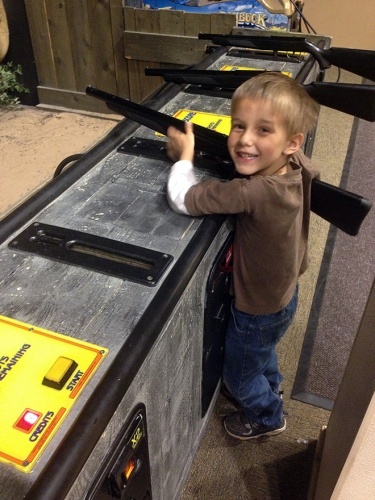 Family safe camping – The good lord, extra supplies and a 12 gauge tactical shotgun with 00 buck for good measure. I think we may stay the night of the 13th of here as well. 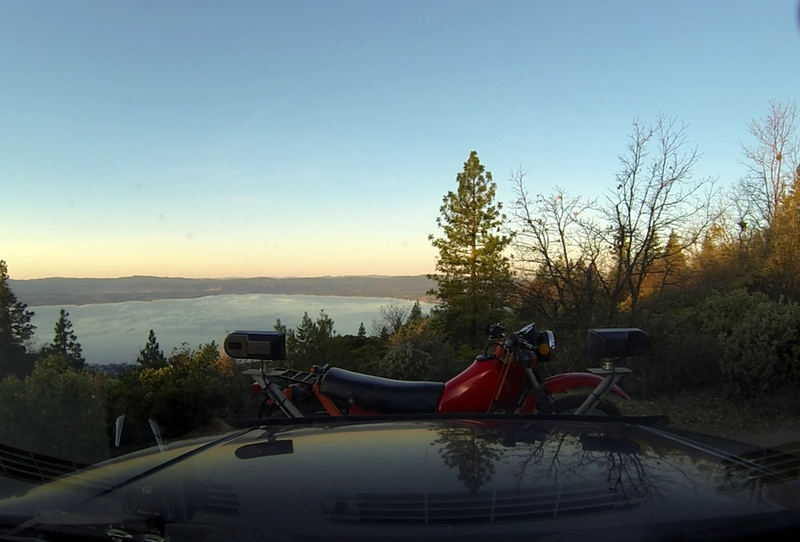 It’s so nice, with whether in the 60’s, room to ride the Honda and beautiful views. I’m starting filming for the Photographics series and I found a great setting for the first chapter so I think I’ll do that tomorrow before we head our on Thurs. Stay tuned because I’ll have some Photographics teasers soon. Behold – The new 360 degree perimeter flood system on the Super Camper. This has been in the works for awhile. I installed the lamps before we left but just finished the wiring today. It’s made up of 8 – 10 Watt LED floodlights running off the batteries. This produces over 7000 lumens of light. In short, we turn this baby on and the area around the camper is lit for about 100ft radius. It’s pretty epic and a great safety feature out here in the wilderness. I also managed to get out for a tranquil California sunset and capture some good stuff. I think the results will be my next Signature Series image. We took it easy around camp today and I finished some scores. Mainly this new light system. 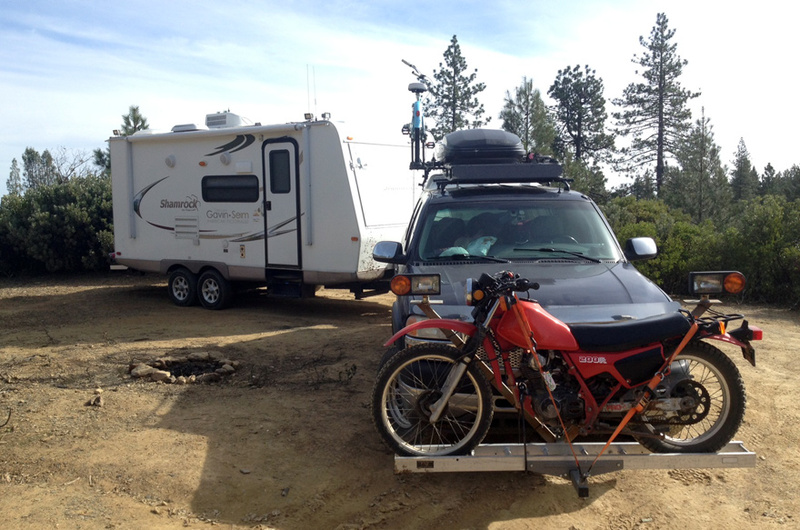 Made it to Clear Lake, CA late and settles in the stunning spot in the forest we scouted last year (see the map) with a view of the whole valley. It’s a quiet region tucked in and surrounded by hills with a giant lake in the center and this is one of the best views around. A view captured by our dashcam before we got up. This is a beautiful area and I plan to scout for more serious images. Found a cool spot way back in the hills off 101 and stayed the night. Sunshine the next morning and we had tome to get out the Honda for awhile, then moving on down the highway towards more sunshine. 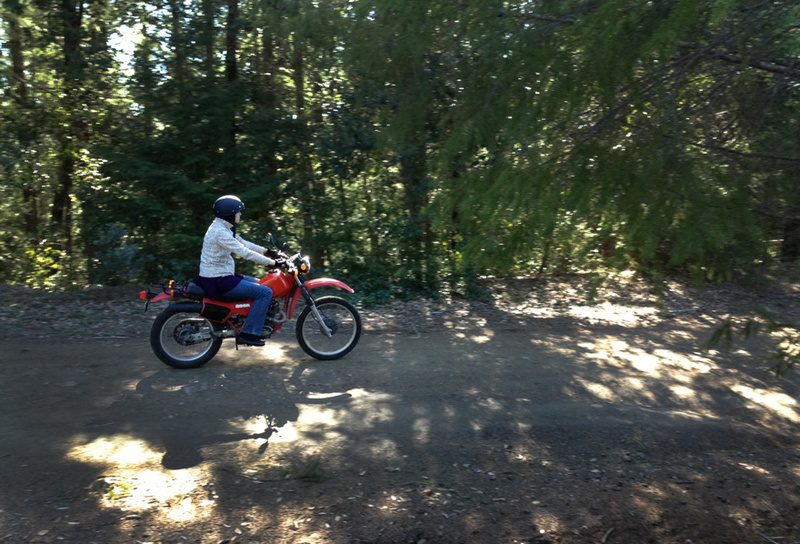 Sondra riding the XL200 that we have mounted on the front of the truck. He headed south over to HWY 101 today. Hit some pretty serious snow along 199 crossing over. Decided to stop and put on the chains. 4 on the truck, 2 on the trailer. Got us thru it with nary a slip. We settles down for the night along the coast in Trinidad, CA. Getting some good window cam footage from the Hero 3 Black. As soon as we get clear of this blasted rain I plan to stop in the hills for a few days and do some light studies. 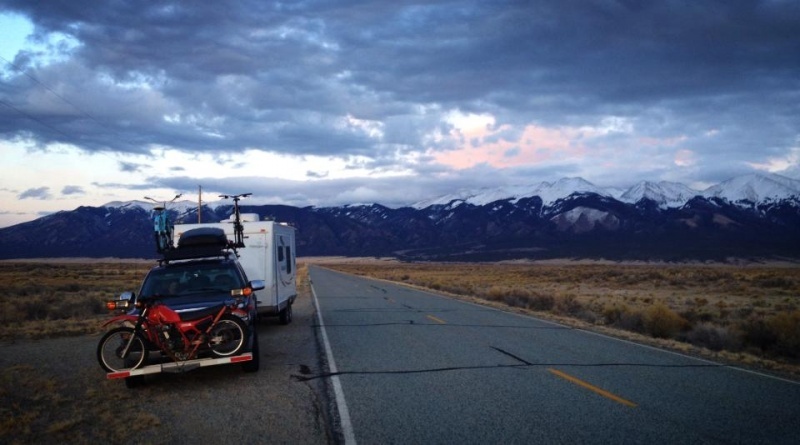 Day 6 – The rig along CA 199. Snowing pretty good, but solid chains all round make the difference. We stopped in Salem Oregon at a friends house and camped in their driveway for the night. 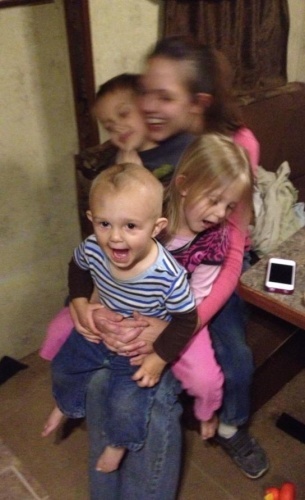 It was nice to hang out and the kids enjoyed playing in a roomy house with friends. Tomorrow it’s back on the road. Ariana just waking up. She’s not a morning person. We stayed in Yakima today and I visited with the Wall Portrait Master Ken Whitmire. I helped him with some computer related things and he dug around in the camera room for a great Hasselblad system which he lent me to try our next to my Linhof 4×5. Ken Whitmire – 2013 at his studio. We’ve loaded up everything and headed out at 5PM. It took awhile. 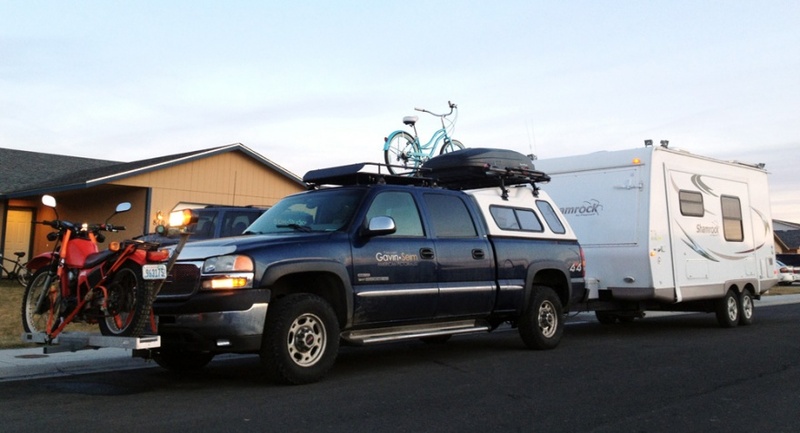 Everything from storage racks, to skis, to a motorcycle is on this rig. Months of planning and finally finished. Lets do this thing. The rig, loaded to the hilt and ready to run. It can take it. It’s a Diesel. This entry was posted in beauty, color, f164, Fine Art, journal, musings, National Park, nature, silver, technique, travel and tagged 2013, american photographer, american pictorialist, art study, beauty, color, f164, film, fine art, first aid, gavin seim, journal, national park, nature, photographics, podcast, road trip, Seim Photography, silver, technique, touring, travel, video. Bookmark the permalink. I envy your 3 month sojourn. I know you’ll take some great images along the way. If you find yourself in Southern California (San Fernando Valley) I’ve got a driveway for you and your family to hang out for awhile. Thanks Robert. I may touch bases sometime. As an Englishman used to single lane roads where you pull over when someone comes the other way, that is a beast of a vehicle. However I did a 2 week road trip between Texas and Florida a few years ago, so I know it’s perfect for your wide open spaces – which I loved. I’m sure you’re having a great time, and it makes me want to get our kids on the road. And enjoy the snow too, got to be some photo op’s there! Be safe have fun, We did a similar trip in 2010, spent 2-1/2 months following the colors of Fall from VT to The Smokies. If you are in Texas during the first couple of weeks of April or so, email me and we will go one Texas Wildflower shooting adventure. Have a great time Gavin, We did Alaska and Canada for 2 and a half months last spring and had a great time (not to mention 12k photographs). I look forward to seeing your work and reading your blog. Yeah… I am happy to watch from sunny south Florida though as you get to take another photo adventure. Enjoy God masterful work that is creation!!!! Safe travels and God’s Speed! Gavin wow! I hope your problems with the truck come to an end. Don’t need to have a bunch of repairs messing up your plans. I enjoy the regular updates on your travels. Wondered what happened to you for the last few days. Seems like you’ve had your share of mechanical and health problems. Get healthy (family too) and make photos. Awesome photos. Nice detail and colors especially the night shots. Got to love road trips. We’re having a good time Ron. Stay tuned for the real images. Everything in here is just travel snaps. The rest is happening behind the scenes. 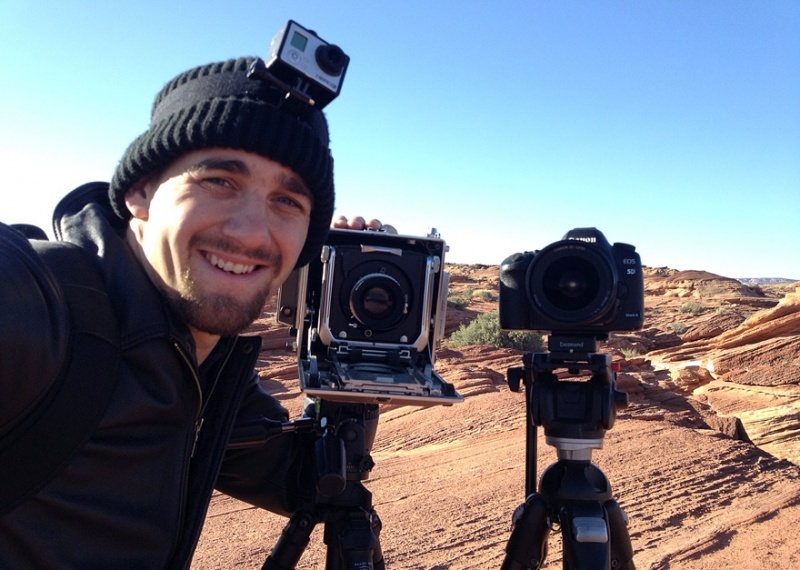 Can’t wait to see what images you’ve captured! The night photography book I told you ’bout (8.00 for the kindle version) is actually pretty cool.. 🙂 SO relieved to know you all are happy happy happy and well! Great blog, I have been following your photographic adventure on your FB page. Great to see all of what you have just posted. Sondra seems like any photographer’s best partner Kudos to her and the kids for going through this three months Great on all of you. 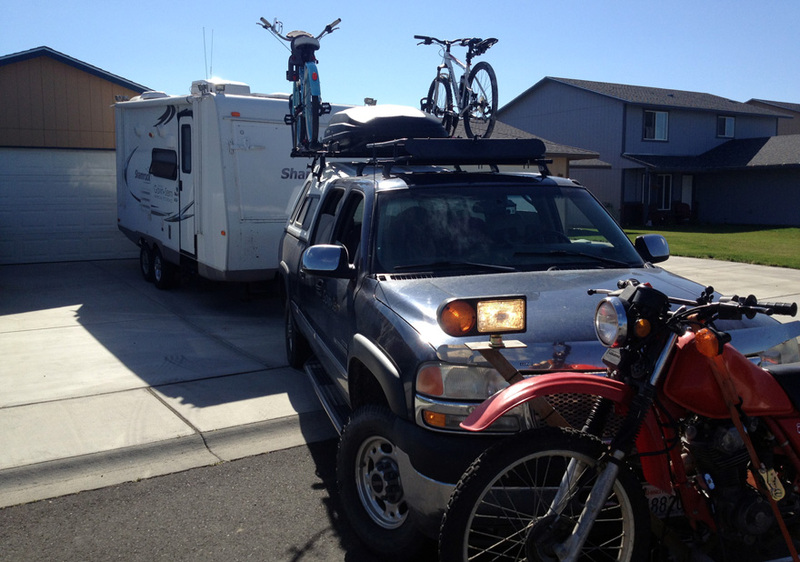 I will be doing a California to Florida and back in six weeks this summer with my girl friend, here two boys 12 and 16 and my son 12 in my RV. I would like to think of it as a photographic trip, but I would not think I would have the understanding your crew did. All the best, Good Light, and please keep posting. Thanks much Dennis. We’re having a good time. Enjoy, there’s nothing like a good road trip. Great pictures. Great looking family. I wish for good health and more interesting trips across the country for you all.